The Pack Experts Committee of the international trade show ALL4PACK Paris was convened on Tuesday 25 October to vote on the 2016 Innovation Awards. Through this distinction, ALL4PACK Paris, The global marketplace for Packaging, Processing, Printing & Handling,pays tribute to firms which demonstrate their exceptional capabilities in innovation and offer proof of the remarkable agility of the entire packaging and intralogistics sectors. Among the 250 new products entered by exhibitors, 42 products were shortlisted by a broad panel of international specialist journalists and will be displayed on a PACK INNOVATION space at ALL4PACK Paris (Hall 7 stand F160), which will be a true source of inspiration to professionals. Equipment, software, automated systems and services for lifting, handling, storage and logistics. The confirmed trend for new products and solutions in packaging and machinery is that functions and performance go hand-in-hand with reduction in consumables and the objective of zero waste. Packaging is the champion of the circular economy. New developments in software, services, handling and logistics are shaping the structure of the factory 4.0. Flexibility is controlling performance, quality and safety. Digital technology stimulates innovation and optimises value along the entire supply chain. Packaging that has become fit-to-size also communicates, software allows on-demand availability, equipment supplies real-time information for immediate responsiveness. New products are shortlisted into an international selection from which the Pack Experts Committee, coordinated by international packaging expert Annette FREIDINGER-LEGAY, makes its “Pack Experts’ Innovation Awards”. ANTONIO PUIG, BEL, CHARAL, COCA COLA Entreprises, ECO-EMBALLAGES, FAUCHON, GALERIES LAFAYETTE, GROUPE CARREFOUR, ILLYCAFFE, L’OREAL, LABORATOIRES EXPANSCIENCE, LE BHV MARAIS, MARS PETCARE France, MERCK, NESTLÉ, PFIZER CONSUMER HEALTHCARE, PHILIPS ÉCLAIRAGE, SOUL PACKAGING, VENTE-PRIVÉE. Category “Raw materials and consumables / Accessories and components / Packaging and containers”: more with less! An increasing range of properties: bottle caps can be twisted on and off with one hand, flow packs can be resealed, large size bags can stand up with their opening system. Practical considerations are everywhere. 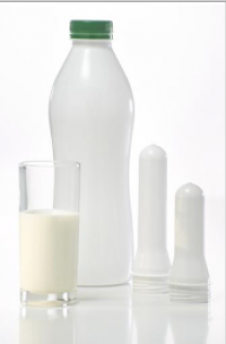 Product safety remains the absolute norm: PET bottles keep UV rays out, water fountains are made of BPA-free PET, antibacterial labels safeguard hygiene, bubble packaging becomes insulating material. On the road to zero waste: lighter materials, plant-based PE and naturally-sourced renewable cellulose fibres are making headway. From the freezer to the oven, packaging can be composted. Zero waste is already a reality for some packaging forms. SGT has developed a range of monolayer PET preforms with the same qualities as multilayer PET. The innovation lies in the formulation of the resin which provides the PET with new properties, including a total barrier to light. 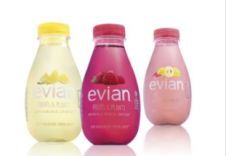 Danone Waters joined forces with Sleever International to create a 100% recyclable packaging solution (label + PET) for its new sleeve bottles for Evian and Vovic. 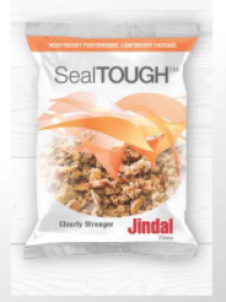 SealTOUGH™ film is a unique coextruded packaging film designed to replace blown PE (polyethylene) films. SealTOUGH provides unmatched puncture resistance, enhanced clarity, improved modulus and seal strength that can exceed 5,000g/25mm. This latest breakthrough technology provides downgauging potential of 30-40% or more, compared to traditional sealant films. 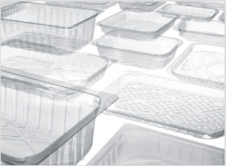 CGL Pack has developed a standard food tray range in a special raw material made of PET which enables perfect sealing even in challenging environments. This is totally recyclable and offers an excellent alternative to the traditional trays made of PP/EVOH/PP. 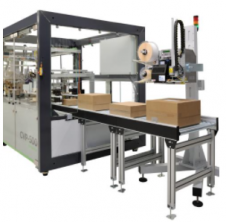 Objective: High OEE (overall equipment effectiveness): the Innovation Awards entrants offer new options: sleeving on a range of products, using collators to arrange packages on demand or modular systems which fit directly onto conveyor belts; enabling format changes in less than a minute or creating bespoke packing boxes for e-commerce. 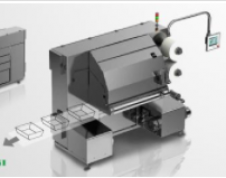 Reducing line wastage and energy consumption: skin pack and MAP packing machines dispense with film heating, and thermoforming machines work with “zero film skeleton”. Smart machines communicate: clip-on sensors can connect up all electrical equipment to enable predictive maintenance, single cables for “communicating and power” no longer need an electrical cabinet. Smart tech is used to enhance worker safety thanks to collaborative robots. 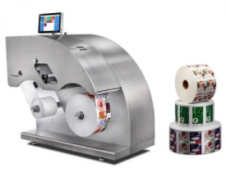 Trojan 2 is the first attempt to offer the market an affordable mini digital label press with has the characteristics of larger and more expensive systems. The press will run at 18 m/min and up to 1600 x 1600 dpi and with sophisticated algorithms and a self-maintaining system it will be able to run larger volumes and maintain high print quality. CVP-500 is an automated system that can pack orders in fit-to-size parcels created on the fly in a few seconds. The system addresses ecommerce players in particular and can handle mono and multi orders alike. Market of application: e-commerce / distance selling. Today's packaging line world is divided into either thermoforming or tray sealing lines, the first producing value packs, the second higher quality packs with greater flexibility. Platformer is the missing link, enabling firms to switch from thermoformed in-line trays from a reel or premade trays at any time, according to needs. Markets of application: food and capital goods. The Factory of the Future or 4.0: in packaging, creation and production cycles are already driven by customers. 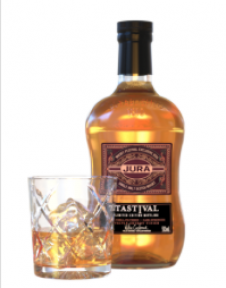 3D design software offers a real-time response to packaging customisation requirements through to shelf stacking. 3D printers make prototypes or parts of packaging in limited series or made-to-measure conveyor parts. Even more flexible and optimised production: UV and 4-colour inkjet printing on cylindrical plastic packs is now possible to 360°. In multi-packs, stretch sleeves can now hold products together without the need for a heat-shrink oven. Further enhanced product security: identification and tracking solutions can now protect the entire chain, smartphone applications based on the package’s intrinsic material verify whether the product is authentic. Connected tablets and glasses can film machines for distance repairs or video-based maintenance. iC3D is the first software for 3D model creation in real-time, to instantly generate digital mock-ups of folding boxes, shrink-wrap, bottles and in-store visualisation. Markets of application: drinks, consumer goods and household appliances, cosmetics and personal hygiene, pharmaceuticals/ healthcare, luxury goods. Category “Equipment, software, automated systems and services for lifting, handling, storage and logistics”: aiming for operational excellence in intralogistics. Intralogistics today offers increasing added value and competitivity: modules for the high-speed conveyance and dispatch of single loads can be attached onto conveyor lines with 24V powered versions, telescopic arms enable presses and machine tools to be loaded and unloaded, combining compactness and versatility. Measuring service quality and performance:viewing systems can count products, read codes and use-by dates, detect non-compliant products and remove them. Racks become dynamic. In e-commerce, conveyors increase the speed of automatic unloading of parcels delivered loose in trucks and containers. 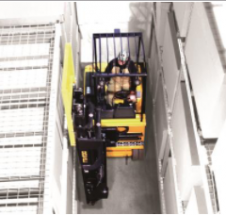 User-friendliness and improvement in working conditions: pullers and pushersadapt to bins and trucks, swing mast forklifts can work in very narrow aisles. Computer programmes analyse data and performance of throughput and AGV productivity. The SLT30/35 are compact 3-wheel front/side loading VNA forklifts with a single smooth rubber rear-drive/steer tire and solid poly-front load tires. The front mast rotates 90° and has side shift 508mm, allowing stacking easily in Very Narrow Aisles. Markets of application: construction / buildings and public works, distributors / agents/ dealers hirers of handling equipment, transport and logistics. Comments from the Committee: Manoeuvrability for enhanced productivity in reduced spaces. All of these innovations will be on display in the PACK INNOVATION space - Hall 7, stand F 160. Monday 14 November 2016 at 11.40am.